Samsung has announced two new devices in its A series at the “A Galaxy Event” in Bangkok. It comes with a 3D Glasstic body with a metal frame. It will also be coming with an in-display fingerprint scanner and will be available in The Angle Gold color options that include elements of Pink, while the Ghost White combines with Blue characteristics. According to the South Korean Giant, these colors will be looking different depending on the light direction and reflection. Furthermore, it will be available in Angle Gold, Ghost White, and Phantom Black color options. 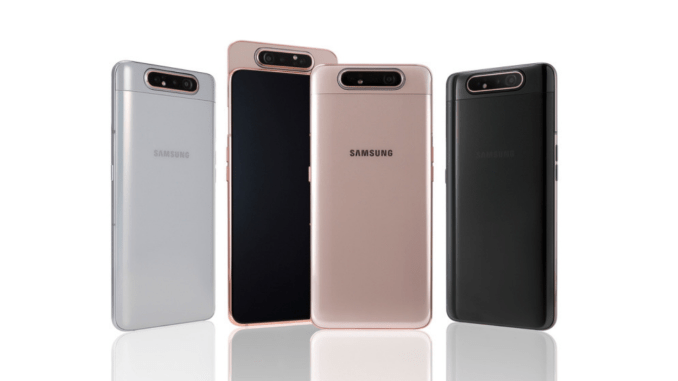 Talking about the specs, the Galaxy A80 will come with 6.7-inch (2400 x 1080 pixels) Full HD+ Infinity-U Super AMOLED display with 20:9 aspect ratio, under the hood there is an Octa-Core Snapdragon 730G SoC coupled with 8GB of RAM and Adreno 618 GPU. It comes out of the box, with Android 9.0 Pie with Samsung One UI on top and this Dual SIM variant will be coming with Dolby Atmos. On the camera front, it will be coming with a 48MP rear as well as on front with LED flash with f/2.0 aperture. There is a secondary 8MP ultra-wide angle camera with f/2.2 aperture size and a 3D Depth camera. It will have an in-display fingerprint sensor and measures 165.2 x 76.5 x 9.3 mm. It will be coming with dual 4G VoLTE connectivity along with Wi-Fi 802.11 ac and Bluetooth v5.0, GPS + GLONASS and USB Type-C along with all other sensors that are required for automation of the handset. It will be having a 3700mAh battery with 25W super fast charging technology and it comes with Angle Gold, Ghost White, and Phantom Black colors options. The device is priced at 649 Euros (approx US$ 729) and will roll out in Europe from May 29th. There is no news about global roll out of the device and which we should be known soon. Are you planning to get this device? Comment in the section below and stay tuned to Android Advices for more.